Chants of Allah-O-Akbar, Marg bar dictator, plus chants in support of Mir Hossein Mousavi and Mehdi Karroubi. Purportedly from Northern Iran tonight. وعده ما بیست و پنجم بهمن. آغاز: ساعت چهار، پایان: تا آزادی! با فریاد، در خیابان! See the original link for Sidsel Wold’s own photos of daily life in Iran. We are sitting at an undisclosed location in Tehran, three young Iranian men in their twenties and me. - Michael Jackson's death devastated the green spring, Babak sighs. A quiet nodding goes around the table in the café's darkest corner. Fearing trouble with the regime the three men in this article only wanted to reveal their first names. They did not want to be photographed. The owner of the cafe also would not risk trouble by openly allowing Western journalists to do interviews in his premises. All three have just told me that they would prefer to leave Iran. That they see no future here now. Babak has visited the British Consulate for two years to ask for a residence permit, but in vain. - I just want to leave this country. I am desperately trying to get away from here, says Babak, who hopes to take a PhD abroad. Borna would prefer to go to Europe or Canada, but not forever. He hopes that Iran will undergo changes while he lives abroad. The others laugh. For here we are at the core. Everyone seems to want the neighbour to rebel. Are dissatisfied Iranians not ready to go out into the streets themselves, as the Syrians do? I ask. This was how the uprising after the controversial counting after the presidential election in 2009 ended. When the Basij militia began using sharp ammunition on people in the streets, the protesters stayed at home. In Iran, I'm trying to figure out what had become of the green movement and where all the students who participated are now. Some have travelled abroad. Others continue with their lives and hope for the best. Several are sitting in cafes like these young men, being depressed. All shake their heads over the blood bath in Syria. It is cruel. - Assad cannot survive this. Eventually, all dictators will fall, Borna thinks. - We Iranians are somewhere between Syria and Europe, says Sina. - We do not have enough to lose yet, so we do not demonstrate with our lives on the stake, as the Syrians are doing. But we're not as civilized as the Europeans, he says. - Do you dream of a good future in Iran? I ask. - Maam, I am just hopeless just now, Babak repeats sorrowful. - We all live in social depression, says the three. One of them is an accountant, the other a musician, the third an engineer. They are in their prime of life and an example of the brain drain that has afflicted the Islamic Republic for decades, but that reached a new peak after the 2009 elections. But change will come, they believe. The collective depression here cannot continue as it is now. Sina does not want a revolution, just reforms. Babak believes it is appropriate to impose sanctions on Iran in order to put pressure on the mullah regime. - But the sanctions also affect the people. It has become dangerous to fly now. Iranian aircrafts cannot find spare parts, and are often affected by technical errors. - I wish Russia and China did not support us. It would be better to be completely isolated, and force a crisis that would lead to a change. - If sanctions were imposed like in South Africa? Asks Sina as to vent the thought. - No, we have no Mandela. Our hope for change and reform has no leader. What do the three think about the Arab spring? - The Arab uprising is a warning to the Iranian regime. Sina says. - The Arab spring does not help me, Babak interrupts. - Why did the West not help us in 2009, when the uprising began here? We were at it, but then Michael Jackson destroyed everything. When he died the world press went out of its wits and broadcasted nothing else. The world forgot Iran altogether. Why did Michael Jackson die just when we finally stood up against the regime? Borna sighs. They look down at the table. Sina lights another cigarette. We have to go. It is clear that neither the guests in the cafe nor the owner feel comfortable with the presence of foreign journalists. When we walked out it was like a sigh of relief closed the door behind us. 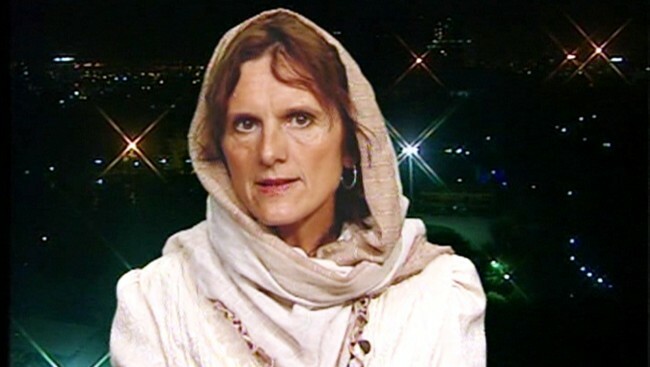 NRK's ​​Sidsel Wold just returned to Tehran, two and a half years since her last visit. She found a quite different and gloomier place, where everyone was afraid and no one opened their mouth. 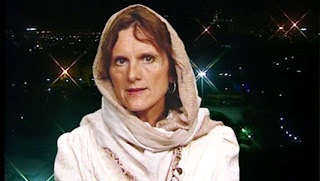 With the shawl pulled over her head NRK’s former Middle East correspondent went back to Tehran to report from one of the world’s most combustible areas. There she met closed doors, frightened people and blocked websites. In this article Sidsel Wold shares her experiences from six days in Tehran with the readers. Wold’s title for her story from Iran, "Darkness at noon", is not randomly chosen. It is the same title as Arthur Koestler's famous novel from 1940, where he reveals the horrors of Stalinism in the Soviet Union. Sidsel Wold was a tour guide in the Soviet Union when she was young, and she draws this comparison when she describes today's Iran. Finally I was going to Iran again! After two years of visits and tea drinking in the Iranian Embassy in Oslo, I was able to collect my prize: The press visa. But in the weeks prior to departure I strongly felt that Tehran had become a different and gloomier place. The last time I was in this metropolis of 14 million people was during the elections in 2009. In the days before the polling stations opened, a green Iranian spring blossomed. People were out in the streets screaming and shouting out their opinion. Most of them demanded reforms. 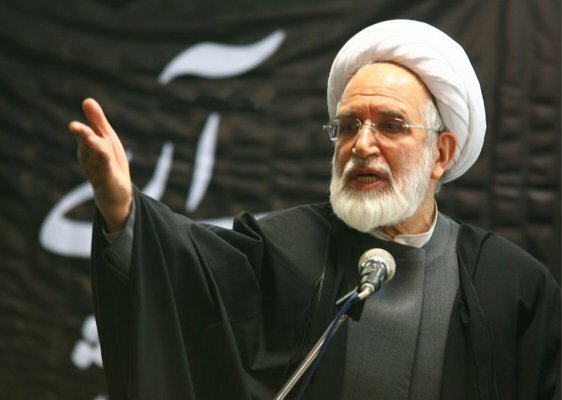 The Opposition’s presidential candidates, Mir Hossein Mousavi and Mehdi Karroubi, were likely to do well. But when the votes were counted, another man was the election’s big winner: President Mahmoud Ahmadinejad. In Tehran's streets the news was met with shock and disappointment. And much anger. It was not long before hundreds of thousands protested in the streets against an election result they believed to be manipulated. After several days of mass demonstrations, the Basij militia went from beating with clubs, to shooting with sharp ammunition. The Basijs are paramilitary hooligans who are paid by the regime to beat up citizens who create unrest. Several people were shot and killed in broad daylight. One was the 16-year-old Neda, the icon of the regime's brutal use of force against young Iranians. Right after Iran's disputed election count, the regime closed the country to foreign news agencies. Since then there has hardly been any Western journalists there. Darkness descended on the ancient Persia. To return to Iran was a dream. The Iranians are a great and proud people that we should listen to. In my opinion, the demonization of the entire Iran because of the acrimonious dispute with the West is unfortunate. So I pulled the shawl over my hair, and began to work to show other sides of the country. I was happy when I finally could walk through the door to Ivansahars premises. Ivansahar is a media agency we have worked with several times in the past, because journalists cannot work here quite the way we want to. We need permission to film, and Ivansahar also sets up interview appointments for us. Film in a bank, and talk to the bank manager about the currency crisis. Talk with a family about how the sanctions affect their daily lives. Talk to nuclear physicists about how the liquidation of their peers has influenced them. Talk to MPs about possible sanctions against the EU. Visit friends of former prime minister Mossadeq who was overthrown by CIA and British intelligence in 1953. If possible: talk to people from the green movement ...? Take pictures in slalom slopes. If two or three of these proposals could turn into good TV material, I would be happy. But when I came into the office I realized that something was wrong. The lights were out, only one employee was left. They had fired their three employees, and the boss had left Iran. Since no press people get a visa to Iran anymore, they had partially closed down the office. But now Ivansahars sole employee had only NRK to deal with, so I was optimistic. In the small hotel Karoon internet was quite OK, except that NRK, Dagbladet, Facebook, Twitter, YouTube and BBC was blocked. And with Yahoo, I could send home both radio material and mail. Then the days went by without any interview appointments. Several times a day I called Ivansahar. Had we been given permission? Appointments? - No, unfortunately. Or: Noone answers. Or: The answer is no. The family of a liquidated nuclear physicist replied that they do not speak to Western Zionist media. Day after day we moved at a snail's pace, caught in Tehran's eternal traffic jams. Since the appointments did not materialize, we had to try and ask for filming permission ourselves, in shops, cafes etc. When we finally arrived, we were often given the same answer: No, you cannot film here. A cafe owner said that yes indeed, we could film at his place later in the day when there were more people around the tables. But when we came in with the camera, the mood quickly changed. The cafe guests became restless, they looked anxiously around as if a storm was approaching. The only thing we were able to film there was our own slices of cake and coffee cups. Before 2009 we had at least two, often three to four appointments each day. We filmed in cafes, in shopping centres, and could interview people without problems. Before 2009 an interpreter took me to the regime-critical journalist Issa Saharkiz, the reformists Ali Abtahi and the dissident Ibrahim Yazdi. - Why do you take me to these critics? I asked the interpreter, who obviously was engaged by Iran's ministry of culture and Islamic guidance. - Because it is important to show the range of opinions here, so you get the whole picture, said the interpreter. Another exciting source was Sayed Hussein Adeli, former ambassador of Iran in the United Kingdom. Now all four of them were out of reach. Their voices are silenced and vanished. Saharkiz is in prison. Abtahi was imprisoned, then turned up on TV 15-20 kilos lighter admitting that he had been wrong. Ibrahim Yazdi, aged 81, was imprisoned after 2009, and later put under house arrest. Adeli has not given interviews in two years, I was told. All four participated in the Islamic revolution in 1979. Yazdi was even with Ayatollah Khomeini on the historic flight from Paris to Tehran after the Shah's fall. Now they are all gagged. The revolution seems to eat its own children. To film in the street and in the bazaar. To film in the slopes. To interview the spokesman for the Iranian Foreign Ministry. We were able to speak to some Iranians in the bazaars. There were those who would not talk on camera, but radio was quite OK.
We also had some luck. One day, an Iranian television reporter came over to us on the street. His team filmed us, as if he wanted to show the viewers of the Iranian state TV channel IRIB that, yes, here is full press freedom for western journalists. But when he wanted to interview me, I quickly said that we had to interview him instead. Of course, smiled the confident, smiling man; of course, we could interview him. I was nervous at the thought of being interviewed by Iranian TV. Because I did not want to say what I really mean. When I was young I worked as a tour guide in the USSR. Memories from that time resurfaced now. Like the Soviets, the Iranians are also afraid to speak now. Some wrote on a sheet of paper instead of talking for fear of spies or microphones. It was like a clammy hand had tightened its grip on the entire community. And then there was the money riyal. During the Soviet era the rubel was a non-convertible currency. Everyone wanted only the great Satan’s money: The dollar. I wanted to exchange my Iranian riyals, which are not convertible in the West any more. Because of inflation the Iranian currency had so many zeros that I no longer understand any of them, and I wanted to exchange them. But no, the banks at the airport did not want them back. - Why do you not want your own money, I asked annoyed. - Only those with Iranian passports can exchange riyal, was the answer. * Dagbladet, Aftenposten and VG are Norwegian newspapers. YR.no is the popular Norwegian weather forecast-site. February 8th, 2012 - [Kaleme] On the eve of the one year anniversary of the illegal house arrest of Mir Hossein Mousavi and Zahra Rahnavard, and following the joint letter recently published by the children of Mousavi and Karroubi, , security forces have reportedly threatened to arrest Mousavi's daughters and one daughter has been banned from activities at the university where she teaches. Kaleme reports that security forces who have in the past repeatedly threatened Mousavi's daughters, this time contacted the daughters directly and threatened to arrest them, transfer them to prison or another location where no one will have any news of them. Furthermore, one of Mousavi's daughters have been banned from activities at the university where she teaches. No explanation has been provided to date regarding why Mousavi's daughter has been banned from the university where she teaches. Despite numerous inquiries into the matter, it is unclear who is behind the order to ban Mousavi's daughter and no one has taken responsibility for the ban. Mousavi's daughter teaches art at the University of Alzahra. It is worth mentioning that the ban took place without any written notice, but Mousavi's daughter was deleted from the university's internet teaching system. In the past year many of the supporters of the Green movement have been detained and imprisoned and their families have also endured extreme pressure. These pressures have included continued arrest of family members, repeated interrogations, interference with every day activities, threat to their lives, pressure and threat at work, being banned from leaving the country and even being banned from pursuing their careers or professions. Last year, Mir Hossein Mousavi and Mehdi Karroubi requested a permit from the ruling government for a rally in support of the freedom fighting movements in the Middle East. Their request for a permit was not only denied, but the ruling government went as far as illegally detaining the two companions of the Green movement in their homes. In the past year Mousavi, Karroubi and Rahnavard have been deprived of the basic rights afforded all prisoners in Iran and their families have been denied the right to contact them by phone or to see them in person. They have been isolated, rendered incommunicado, kept in the dark with regards to the condition of their families, told lies and even prevented from attending the funeral of their loved ones. Their arrest, the ambiguity regarding their location, their well being and the medicines they have been prescribed points to the possibility of dangerous scenarios designed to put their lives at risk. Although in principle this illegal arrest is similar to all other questionable and illegal arrests that have taken place since 2009; arrests that were merely as the result of the commitment by Green activists and their sense of responsibility towards the challenges facing our nation, what makes it bizarre and unprecedented is the fact that an unjust political conflict has now entered the daily lives of family members of the arrested and detained. It goes without saying that given that Mousavi and Karroubi have repeatedly reiterated that they will remain true to their oath with the people and their family's insistence to stand by their demand for justice, these type of tactics by the ruling government are fruitless and will lead to nothing more than short term and temporary gains. در آستانه یکمین سال از زندان خانگی میرحسین موسوی و زهرا رهنورد و بلافاصله پس از انتشار نامه مشترک فرزندان میر حسین و کروبی، دختران میرحسین موسوی از سوی زندانبانان تهدید به بازداشت شدند و یکی از دختران آنان از تدریس در دانشگاه منع شد. به گزارش کلمه، ماموران امنیتی که پیش از این بارها دختران میرحسین موسوی را تهدیدهای کاری و جانی کرده بودند این بار تماس گرفته و تهدید نموده اندکه آنها را بازداشت و به زندان یا مکانی منتقل خواهند کرد که هیچ کس از آن خبردار نشود. همچنین یکی از دختران میرحسین از ادامه فعالیت در دانشگاه بازداشته شد. برای این ممانعت از تدریس دختر میرحسین تا کنون هیچ گونه توضیحی داده نشده و مرجع دستور به ممانعت نیز مشخص نیست و علیرغم پیگیری ها کسی حاضر به قبول مسوولیت نشده است. دختر میر حسین در رشته هنر در دانشگاه الزهرا تدریس می کند. این ممانعت بدون ارائه دستور کتبی و تنها با حذف از سیستم اینترنتی آموزشی و به صورت غیر مکتوب بوده است. طی یک سال گذشته نه تنها همراهان جنبش سبز در حصر و زندان بوده اند بلکه خانواده آنان نیز بشدت تحت انواع فشارهای مرئی و نامرئی قرار گرفته اند. دامنه این فشارها از دستگیری پی درپی اعضای خانواده ، بازجوییهای مکرر ، دخالت در مراسم و روال عادی زندگی ، تهدیدهای جانی یا شغلی تا ممنوع الخروجی و یا ممانعت از فعالیتهای مرسوم کاری بوده است. سال گذشته میر حسین موسوی و مهدی کروبی در حمایت از قیام های مردم منطقه درخواست مجوز یک راهپیمایی کردند که نه تنها به این درخواست پاسخ داده نشد بلکه این دو همراه جنبش سبز به طور غیرقانونی در خانه های خود زندانی شدند. طی یک سال گذشته موسوی و کروبی و رهنورد از حداقل حقوق زندانی نیز برخوردار نبوده و خانواده آنان از امکان تماس تلفنی و ملاقات دیداری ،وسایل ارتباطی محروم هستند آنها از سایر حقوق زندانیان نیز چنانکه بارها گفته شده بی بهره بوده اند. دور نگهداشتن آنها از چشم های ناظر از یک سو و بی خبر نگهداشتن آنها از مسائلی که در خانواده می گذرد ارائه اخبار دروغ و در مورد اخیر حتی جلوگیری از شرکت در ختم اقوام نزدیک بخشی از این موارد بوده است. دستگیری آنان، ابهام در محل نگهداری و سلامت دارویی، امکان سناریو های خطرناکی که جان آنها را نشانه رفته است را دامن میزند. اگرچه در اصل این دستگیری غیرقانونی همچون سایر دستگیری های گسترده از سال ۸۸ تاکنون ، که تنها به دلیل تعهد و مسئولیت فعالین سبز اندیش نسبت به مسائل کشور صورت گرفته از هر نظر قابل سوال است، اما مساله عجیب تر و بی سابقه تر اینکه دامنه آن به اعضای خانواده سرایت کرده و سطح یک درگیری نا عادلانه سیاسی را به مسائل خانوادگی نزدیک کرده است که با توجه به تاکید مدام آنان بر ایستادگی و مقاومت بر عهد خود با مردم و همچنین عزم خانواده ها بر همگامی با عزیزانشان بر حق جویی ،جز تلاش برای ایجاد التهاب های موقتی سود و بهره دیگری ندارد. Today the leaders of Iran’s Green opposition movement, Mir Hussein Mousavi, his wife Zarah Rahnavard and Mehdi Karroubi, have spent exactly nine months under strict house arrest. 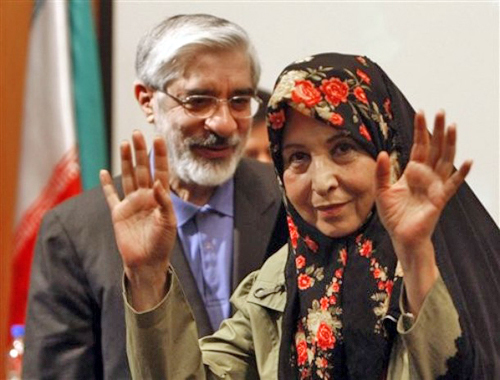 In the beginning Karroubi’s wife, Fatemeh, was also kept under house arrest. She was however temporarily released this summer due to health problems. As far as I know she is now back in house arrest again. There doesn’t seem to be as many live blogs active today as there was one week ago. But since the Green movement has announced protests for today (every Tuesday until the Iranian new year, or Norouz), I’ll link the blogs I have found below. Please notify me of other blogs. The blogs listed below are following the 10 Esfand (1 March) protets in Iran live. Protests are scheduled for 5 pm in Tehran. Protests in other cities have also been announced. My live-blogger Twitter list also gives easy access to reliable news from Iran. Please use the comment field to notify me of other blogs. After the confirmed arrest of the two opposition leaders, reports from Iran tell of anger and determination. The reignition of the Green movement we saw on 25 Bahman and 1 Esfand will has brought the Iranian people back on the streets. Tune in for tomorrows live blogs. My blogger name is KIMBER. My Twitter name is @kiraber. Please contact me on Twitter if you have suggestions for this blog. Is Reddit the Best Way to Follow the Crisis in Syria? The New Iranian.com Is Ready! Iran News Digest | Stay Informed. Stay Green.